At Zillow Group, we believe strongly that embracing a diverse workforce not only enhances Zillow Group’s workplace culture, but also is key to our success as a company. That is why, today, we are pleased to announce that for the second consecutive year, we have been selected for the Bloomberg Gender-Equality Index (GEI). 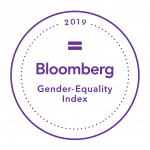 The Bloomberg GEI is composed of companies that have scored above a globally established threshold designed to encourage disclosure and reward companies committed to transparency in gender reporting and advancing women’s equality. Our work in equity and belonging requires an ongoing and evolving commitment, which means there is no “mission accomplished.” We look forward to continuing our commitment. Interested in learning more about our culture? Check out our Instagram page, @zillowgrouplife! Want to join our award-winning company? Check out our career page for current openings! Zillow Group Named One of Fortune’s Best Workplaces for Diversity Zillow Group is one of Fortune’s 100 Best Companies to Work For!